There are two ways of pickling this kizhangu. This method is done using fresh curd. This can be preserved for more than a year. This has a strong odour and some do not like this pickle. Even I did not like it while I was young. My grandma says that when I was a child, I will eat even green chillies raw, if bought by me. Probably because of that cradle nature of mine, I started liking it, while making pickles on my own. The english name for this is Sariba. This is an appetizer and blood purifier and has great medicinal values. Mahali kizhangu - 1 kg. Salt - The secret of salt in pickling is mentioned in the method. CUTTING THE KIZHANGU: Cut it through the sides OR cut into two from centre. Discard the centre stem which will be very thick. Select tender mahali kizhangu. Wash well. Take a vessel of water. Peel the kizhangu and immerse in water to prevent discolouration. Now, cut the mahali kizhangu into small cubes through the sides. Discard the centre thick stem. Wash well again and also immerse the cut kizhangu in water. Salt secret: Generally, I make pickles in the ratio 10:1. (Grandma's tips). (i.e.) 10 measures of cut kizhangu or maavadu or lime or whatever it is and 1 measure of salt. The pickle if done in this ratio will last long. However, the measures differ according to one's taste. Beat curds. Grind together, mustard seeds, dry red chillies & turmeric to a fine paste using little water. Mix this to the beaten curd. Mix well. 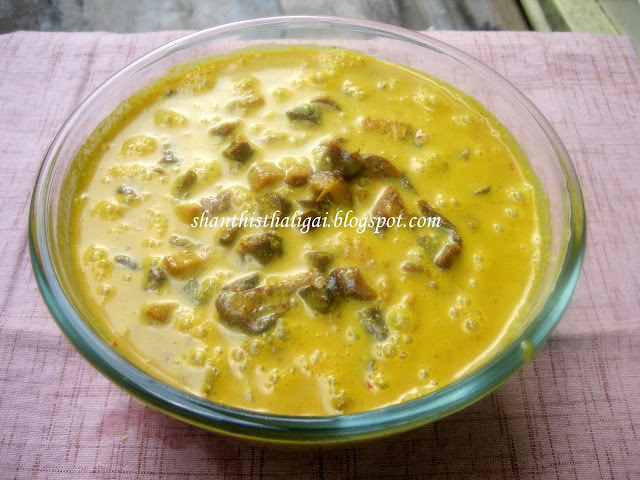 Transfer the cut kizhangu to a bottle or ceramic jaadi, add the salt and the curd mixture. Mix well. Shake/mix well once in a day. This will be ready by 2 days if the kizhangu is tender. This can be preserved even for a year. Transfer the kizhangu after cutting it as above, add salt, turmeric powder, ground red chilli paste and squeeze the juice of 8 lemons into it. Very unique pickle, have seen this kizhangu back home, but never had them...looks fantastic..
Mahali kizhangu is my favourite pickle right from childhood. I have it in a large portion with thair sadam. I f I visit someone for lunch and if they have this pickle, I am the first one to grab it and have it. A very unique pickle. I have never had this :) Looks really delicious. Missing this mahali oorugai since a long time. Never liked it as a child, but now I love it with thayir saadam. Even though I cannot make this pickle here in US, the picture itself reminds me of my patty's mahali pickle and makes my mouth water. Virtually having it. Thanks . Looks good but sorry i really don't eat this veg.I mean don't like the smell.But my son loves this. Nice recipe Maami! I've never never eaten this in my life - I remember my mom used to make it at home and dad likes it - but like you, I never ate pickles! Even now, I don't eat pickles. But I'll try this sometime for the others in my place! Pickle looks delicious. Never knew what to do that kilangu we get in T.Nagar, in Madras:)Thanks for the recipe. This is a new pickle for me...sounds interesting! Wow I love the smell and mahali pickle with curd rice. My Mom just loves this and me, not so much. It does have a strong flavor. Once again, a very traditional recipe. The first time I heard about this pickle was after my wedding 5yrs back. I am not a big fan of the pickle but my husband is. I never thought that it will be something I would wanna try. But yours is very inspiring will surely try it sometime when I come to India. Salt proportion is very useful. good guidance. thank u.
yes you can ... in limits. I saw this pickle shown by a lady on LF channel.Can you please tell me where to buy this pickle.